The Scholarships and Student Aid Ofﬁce (SSA) makes every effort to assist students in the financing of their education. The primary objective of the Scholarships and Student Aid Office is to meet the demonstrated ﬁnancial need of as many students as possible by using a combination of available funds. To apply for ﬁnancial aid, students must complete the FAFSA (Free Application for Federal Student Aid) at www.fafsa.gov as soon as possible. Students are encouraged to apply for ﬁnancial aid electronically for rapid processing at www.fafsa.gov. Applicants should make sure the correct award year is selected and the school code of 002950 is listed in section six. Students who comply with the published deadline for application completion will be given priority for awarding. January 1 - FAFSA for the Fall Semester must be filed online at www.fafsa.gov. The Free Application for Federal Student Aid (FAFSA) must be processed in order to be considered for the UNC Need Based Grant and the Educational Lottery Scholarship. Undergraduate students only. Eligibility for Pell Grant is based on ﬁnancial need as determined by the U.S. Department of Education. Students apply by ﬁlling out the Free Application for Federal Student Aid or the Renewal Application at www.fafsa.gov. Pell Grant payments may range from $595 to $5,730. This grant will be reduced for students who enroll less than full-time. The Pell Grant will appear as a credit on a student’s account. Undergraduate students only. Eligibility for FSEOG is based upon ﬁnancial need determined by the information provided on the application for ﬁnancial aid. Students who are eligible for Pell Grants and who demonstrate the greatest need are given priority in receiving FSEOG. FSEOG funds will appear as a credit on a student’s account. The grant will be reduced for students who enroll for less than full-time. Grants are generally $1,000 for in-state and $2,000 for out-of-state students per school year. Students apply by ﬁlling out the Free Application for Federal Student Aid or the Renewal Application. Provides $4,000 for each academic year with maximum of $16,000 for undergraduate students and $8,000 for graduate students. Students must have 3.25 GPA and be completing or have plans to complete coursework necessary to begin a career in teaching Must agree to teach in a Title I School. Must teach in specified areas (mathematics, science, foreign language, bilingual education, special education, or high-need field). This grant is treated as a Direct Unsubsidized Loan if student does not teach. Student applies by filing out the Free Application for Federal Student Aid. North Carolina Central University is approved to certify Veterans, Active Duty Service members, and their eligible family members for training time in any one of the approved programs of education under provisions of Titles 38 and 10 United States Code. The Veterans Administration offers six different education benefits to Veterans, Active Duty Service members, and eligible family members. Through the Office of Veterans Affairs at North Carolina Central University, students are educated about which benefits they may be eligible for and are assisted in applying for such benefits. The Office of Veterans Affairs is located in the NCCU Veterans Resource Center in Suite 216 of the Miller Morgan Building, and is a part of the Division of Enrollment Management. For general inquiries, to arrange a Transition Assistance Planning Session (TAPS) or to receive assistance in applying for your VA Benefits, please contact the NCCU Veterans Resource Center at 919-530-5000 or veteransaffairs@nccu.edu. You may also contact the Veterans Administration at 1-888-442-4551 or log onto www.benefits.va.gov/gibill and use the submit a question link. Those who are on Active Drill/Reserve status pay be eligible for this benefit with approval from their Commanding Officer. Benefits may be applied for upon completion of basic and MOS/Rate training and ofter obtaining a signed Notice of Basic Eligibility, NOBE, from their Command. This benefit is paid directly to the individual and must be verified by the student on the last day of each month enrolled in training. Benefits are paid out proporionately based on training time. Service members remain eligible while on Active Reserve/Drill status. For individuals who were called to Active Duty status for war or a national emergency. To be eligible, service members must have served at least 90 days of consecutive service. This benefit is paid directly to the individual and must be verified by the student on the last day of each month enrolled in training. Benefits are paid out proportionately based on training time. Those eligible receive 36 months of benefits with an expiration of 10 years after the discharge date. Note: If you were not enrolled, certified in an academic program and using this benefit the semester immediately preceding November 25, 2015, you will not be eligible for this benefit as it has been discontinued. An individual may be eligible if he/she entered the Military on or after July 1, 1985, served at least two years, contributed $100.00 a month for the first 12 months of service, and were honorably discharged. This benefit must be used within 10 years of the service members discharge date. This benefit is paid directly to the individual and must be verified by the student on the last day of each month enrolled in training. Benefits are paid out proportionately based on training time. For the retraining of certain Veterans with a service-connected disability of at least 10%. Entitlement is determined by a VA Vocational Rehabilitation Counselor and is based on how current work conditions are intensifying or aggravating a service connected disability. Benefits provide a monthly subsistence allowance for those enrolled over half time, and cover the cost of tuition, books, educational supplies and parking. Post 9/11 Veterans Educational Assistance Act of 2008 (Post 9/11 GI Bill) is the newest education benefit for individuals with active duty service after September 11, 2011. Active Duty, Veterans, and family members may be eligible for this benefit as long as the service member spent at least 90 days on Active Duty Status; Active Duty service time need not be consecutive. This benefit includes a payment of Tuition and Fees disbursed directly to the University and a Housing Allowance and Book Stipend paid directly to the student. Veterans who are eligible for more than one VA education benefit must make an irrevocable choice giving up one benefit in order to receive Post 9/11 Chapter 33. Transfer of Entitlement: Service members can qualify for Transfer of Entitlement, or TOE, if they have completed at least six years of service and have a reenlistment to serve four more, or 10 years of service time. Transfer of Entitlement, allows the service member to transfer all or portions of their 36 months of benefits to their spouse or children. For Spouses and Children of service members who died in the line of duty after September 11, 2001. Those eligible will receive all 36 months of entitlement at the 100% benefit rating. Those whose Veteran lost their life after August 1, 2011 must make an irrevocable election to this benefit in lieu of DEA. Revises transfer of entitlement criteria for certain individuals. Expands the period of eligibility to 15 years after military service. Amendment: Fry Scholarship: For child/children (under 33 years old) of active duty members who died in the line of duty after September 10, 2001. A spouse or child of a Veteran who is declared 100% totally or permanently disabled due to service connected disabilities may be eligible for this benefit. Also a surviving spouse or children of a Veteran who died on active duty or due to complications with a service connected disability may also be eligible. DEA includes 45 months of entitlement and is paid directly to the student at the end of each month; amount of payment is based on the rate of training. Those who lost their Veteran prior to August 1, 2011 may be eligible for both DEA and the Fry Scholarship not to exceed 81 months of benefits. This section states that a Veteran using Montgomery GI Bill Chapter 30 benefits or Post 9/11 Chapter 33 benefits may qualify for instate tuition as long as they are within three years of their discharge date, reside in the same state in which the University is located and maintain consecutive enrollment. The spouse and children using Post 9/11 GI Bill Transfer of Entitlement or the Fry Scholarship may also qualify for instate tuition as long as the above three criteria are met. Active Duty service members do not qualify for this benefit unless currently stationed in North Carolina. This is a two-year undergraduate scholarship for entering North Carolina Community College graduates. This Scholarship is based on the AA/AS/AAS degree. GPA’s: 2.75 - 3.0 GPA = $2,000 a year; 3.1 - 3.599 GPA = $2,500 a year; 3.6 - 4.00 GPA = $3,000 a year. This Scholarship covers four semesters of consecutive enrollment at NCCU. Awards range from $200 to full payment of educational expenses. You must have a documented record of sports participation and outstanding athletics ability to be eligible for this scholarship. You must meet all of the University’s admission requirements and enroll as a full time student. Scholarships may be renewed contingent upon academic and athletic performance. An online database of University endowed and annual scholarships are listed every January for the upcoming academic year. Admitted students can apply for up to five scholarships by completing the online University scholarship application between January and end of February. Scholarship recipients are chosen by the various departments on campus. Selected students will receive notification from the Office of Scholarships and Student Aid by May 1. The website is www.nccu.edu/scholarships. To be eligible, one must meet all of the University admissions requirements. This grant is available to NC residents. The value of the award varies and applicants are required to complete the FAFSA and submit supporting documentation, if selected for verification. Funds are administered on a first come, first served basis. Students are encouraged to complete the FAFSA on January 1st of each year. Awards range from $500 to $4200. Students can receive this award for a maximum of eight semesters. Provide financial assistance to needy North Carolina resident students attending eligible colleges and universities located within the state. Eligibility is determined based on the same criteria as the Federal Pell Grant with one exception; students not eligible for the Federal Pell Grant with an estimated family contribution of 5000 or less may be eligible for an Education Lottery Scholarship. Students who have earned baccalaureate (four-year) college degrees are ineligible. Grants will range from $100 to $3,000 for the year. Students can receive this award for a maximum of eight semesters. Applicants must complete the Free Application for Federal Student Aid (FAFSA) which is also used to qualify for the Federal Pell Grant. This award is funded by a grant from the Golden LEAF Foundation to students residing in one of the 56 North Carolina counties who will enroll at one of the 16 public universities (the University of North Carolina (UNC) system campuses). Three categories of students will receive funding: high school students who will be freshmen, transfer students from North Carolina colleges who will enroll for the first time at UNC system campuses, and students who received Golden LEAF Scholarships at UNC system campuses during the academic year. Applications, program information, deadlines, and additional information are posted at: www.goldenleaf.org/scholarships.html. To be eligible for this award, one must currently reside in Hoke County, NC, enroll as full-time student and have an academic average of 3.0 or better. An entering freshman must be ranked in the top 25% of his/her graduating class. To be eligible for this award, one must be an undergraduate student, enrolled full time, N.C. resident and have an academic average of 3.0. An entering freshman must be ranked in the top 25% of his/her graduating class. The annual award if $5000. To be eligible for this award, one must have a 3.0 GPA, rank in the top 25% of the high school graduating class, in the case of an entering freshman, and be a N.C. resident undergraduate full-time student. This award is usually made to a University scholar who is an undergraduate student. The annual award is $950. The North Carolina Education and Training Voucher (ETV) Program offers grants to foster youth and former foster youth to attend colleges, universities, and vocational training institutions. Students may receive up to $5,000 a year for four years as they pursue higher education. The funds may be used for tuition, books, or qualified living expenses related to post-secondary education. Additional program information is available at www.statevoucher.org. Students must be legally blind or have a progressive eye condition that may result in blindness, thereby creating an employment handicap for the individual. Students must be a North Carolina resident enrolled in a full-time undergraduate or graduate program. The amount of the assistance is based on financial need. The assistance covers tuition fees, books and supplies, and reader service. In order to qualify, a student must have a mental or physical disability that is a handicap to employment. There must also be a reasonable expectation that as a result of vocational rehabilitation services the person may become gainfully employed. The amount of the award is based on need and type of program in which the individual is enrolled. It generally pays for tuition and fees. The amount of coverage for supportive services such as attendant services, transportation, and books depends on financial eligibility. Award is available to a full time North Carolina resident undergraduate majoring in Criminal Justice. First priority in selection is given to a son or daughter of any law enforcement officer killed in the line of duty. Second priority is given to a son or daughter of any sheriff or deputy sheriff who is deceased, retired (regular or disability). 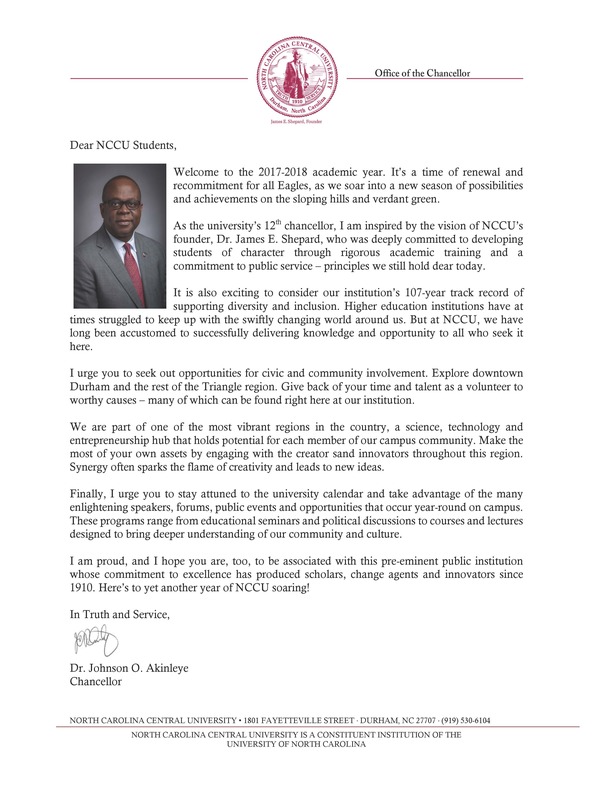 Third priority is given to any resident criminal justice student meeting NCCU’s academic and financial need criteria. The non-renewable awards are valued at $2,000 each. Application deadline is annually February 15th. This program provides financial assistance in the form of forgivable loans to students who are committed to working in North Carolina in high need fields. You may be eligible in you are planning to pursue nursing, teaching or an allied health profession. The FELS award is available to North Carolina residents attending one of the 16 UNC colleges and universities. The annual award which ranges from $3,000 to $14,000 is based on your enrollment and classification. For more information, please visit www.cfnc.org. The DC Tuition Assistance Grant was created in November 1999 by the District of Columbia College Access Act. The grant provides funds to District residents. DC TAG may be used to attend any of the more than 2,500 public colleges around the county. The grant pays the difference between the in-state and out-of-state tuition. The award is paid directly to the institution and is equal to the difference between the in-state and out-of-state tuition up to $10,000 per year. There is a lifetime maximum of $50,000. DC Web site provides useful information on the program. It can be found at the following address: www.tuitiongrants.dc.gov. Eligibility is based on the following criteria: a resident of the District enrolled in college as a full time student, in good academic standing according to the standards set by the college, and demonstrates ﬁnancial need. Additional information can be obtained by emailing: dccapoff@aol.com. Established in 1988 by Burroughs Wellcome Company in the Research Triangle Park, this program offers Triangle residents the opportunity to improve their lives through further education or training. Any person who has been a permanent resident of Chatham, Durham, Orange, or Wake County for the past six months, who can demonstrate the potential to succeed despite adversity, and who has an exceptional desire to improve himself or herself through further education or training may apply. There are no limitations on age, income level, previous education, course of study, or training program the applicant is planning to pursue. Scholarship may be used to begin a program or continue a program in which the applicant is already enrolled. It may be used for technical or community college programs, vocational or trade programs, or four-year college or university studies. Between four and six awards are made annually up to $5,000 per year for a maximum of four years. Scholarship may be applied to expenses for tuition, required fees, and required books. Applications may be obtained by contacting the Triangle Community Foundation Scholarship Program; PO Box 12834; Research Triangle Park, NC 27709; (919) 549-9840 or by E-mail marion@trianglecf.org. All application materials must be postmarked on or before April 1. Student must be active member of the North Carolina Army or Air National Guard and remain a member of the National Guard for two years following the end of the academic period for which tuition assistance is provided. Student must enroll in an eligible business or trade school, a private or state educational institution in North Carolina, and must maintain a “C” or better grade point average. Student may not be enrolled in a program designed primarily for preparation in a religious vocation. This is an award for which a student must work. Money is earned hourly, and the student is paid bi-weekly. This award is available to undergraduate and graduate students based on need, using the information provided on the application for ﬁnancial aid to determine eligibility. FWS awards will not appear as a credit on a student’s account. The average FWS undergraduate employee works ten hours per week and typically earns from $500 to $1,000 per academic year at a minimum rate of $7.50 per hour. The average FWS graduate/ professional employee works ten to twenty hours per week and typically earns from $1,000 to $2,000 per academic year at a minimum rate of $10.00 per hour. Students can make their work more meaningful by performing Community Service in the Durham community or by participating in the America Reads Program tutoring at elementary schools at a rate of $8.00 per hour. Students are required to have an approved Work-Study contract on ﬁle administered by the Ofﬁce of Scholarships and Student Aid prior to working. This is an award for which a student must work. The student is paid bi-weekly. This is not a need-based program. Wage rates, hours, and conditions of employment are strictly between the student and the employer. Work-Aid awards will not appear as a credit on the student’s account. This program is coordinated by the University Career Counseling and Placement Center. If a student is enrolling for Summer School the FAFSA for the current year (i.e. 2015-16) and the upcoming year (i.e. 2016-17) must be completed. Complete the Free Application for Federal Student Aid (FAFSA) online at www.fafsa.gov. Please indicate our school code of 002950 in section six. Please verify that North Carolina Central University is listed on the Student Aid Report (SAR). The expiration date for the Free Application for Federal Student Aid (FAFSA) is June 30th. Students attending the second session of summer school should closely monitor the deadline date to ensure that the FAFSA is processed before the deadline. Also, if a student is interested in receiving a loan, please complete the master promissory note and entrance loan counseling session online at www.studentloans.gov. The deadline date for the FAFSA appears prior to the start date for the second session of summer school. It is a paperless application process. Prior to receiving aid for Summer School, a student must be advised by an academic advisor and registered for Summer School in the summer sessions desired. Classes must appear in BANNER. Registered students will be awarded automatically. The financial aid award will be based on the registered session(s) (Summer I, II, or I and II) and hours at the time the summer school award is processed by our office. View and accept Summer award using my EOL. Students with a prior bill or those who are Studying Abroad will need to complete a paper Summer School application available online at www.nccu.edu/ssa. The Office of Scholarship and Student Aid at North Carolina Central University is required to monitor a student’s academic progress including the withdrawing from classes. The Return of Title IV Funds policy is separate from each college’s refund policy. A student who withdraws from the semester (regardless of the reason i.e., medical, extenuating circumstances, suspension, etc.) may have their financial aid adjusted through the Return of Title IV funds process. The return of Title IV funds may result in the student having an outstanding balance owed to North Carolina Central University. If a student receives financial aid, but never attends classes, the Office of Scholarship and Student Aid must return all disbursed funds to the respective federal and institutional aid programs. The student’s account will be updated, and the student will be responsible for any balance due. Return of Title IV Funds is based on the premise that students “earn” financial aid for each calendar day that they attend classes. Thus, unearned aid must be returned based on the students last day of attendance. The refund cancellation is only required when student withdraws from all classes during the term. Students who complete more than 60 percent of the semester are considered to have earned 100 percent of their financial aid. Students enrolled in both Summer I and Summer II classes and decide not to attend Summer Session II, must officially drop Summer II classes before Summer Session I ends to avoid a refund calculation of financial aid funds received during Summer I. Summer II financial aid funds will be canceled and returned for students who fail to attend. At the end of each term, a non-passing grade report is generated of all students who have Title IV federal aid and a combination of failed and withdrawn grades for the term. The report is reviewed for those students and the 50% date of the term is used in the Return of Title IV Funds calculation. The Office of Scholarships and Student Aid will return all unearned aid back to the appropriate federal programs and the student’s account will be charged. SSA will email or mail a notification letter with the repayment amount(s) to the student’s permanent address or email address. The student’s account will be updated, and the student will be responsible for any balance due. Students must have submitted the Free Application for Federal Student Aid (FAFSA) for the upcoming year. The amount of Pell is based on your Expected Family Contribution (EFC) and number of hours enrolled. The types of aid available during the summer vary based on the student’s remaining eligibility for Pell Grant and loans. To qualify for a student or parent loan, a student must be enrolled at least on a half-time basis, undergraduates six (6) hours, and graduates four and one-half (4.5) hours. If there is a class schedule change that results in enrollment of less than half-time, the Stafford and/or plus loans will be canceled. An initial award notification will be mailed to your permanent address. Students are expected to visit Eagles Online for award updates which include reductions and cancellations and increases. Grants are awarded based on registered hours, if a student’s actual enrolled hours are reduced due to dropped or cancellation of classes, the funds will be reduced appropriately. A student must be enrolled on at least a half-time basis for student and parent loans, undergraduates six (6) hours and graduates four and one-half (4.5) hours. If there is a change in a student’s class schedule that results in enrollment of less than half-time, the Stafford and/or PLUS loans will be canceled. The application process has been simplified through FAFSA on the web. Students may electronically submit a new or renewal financial aid application on the web at www.fafsa.gov. Applying on the web allows students to track the status of their applications and make corrections, and the processing time is reduced. If students have not filed taxes, the income information reported on their W-2 forms may be used to complete the financial aid application. Tax filers may automatically transfer data from tax returns by selecting the IRS data retrieval option when completing the FAFSA. We suggest that the student and a parent (if dependent) obtain an FSA ID at www.studentloans.gov. Electronically signing the FAFSA ID expedites the application process. The priority date for filing the financial aid application is January 1st. Students are encouraged to file for financial aid on January 1st. Also, tax returns should be filed early. Tax data may be obtained by requesting a tax transcript from the Internal Revenue Service (IRS) or an electronic submission through the IRS Data Retrieval (quickest method). Electronically transfer tax data through the IRS Data Retrieval Option available at the FAFSA website if you are selected for verification (the electronic option will be available two weeks after your tax returns are processed by the IRS Office). Electronic filing of the tax return will save time; results will be available in 5 to 7 days. However, if you submit a paper tax return to the IRS Office, it will take 4 to 6 weeks for the tax return to be processed. To avoid delays, please submit requested documents such as, verification worksheets, tax transcripts and W-2s upon request. It is important to review each document to ensure appropriate signatures appear. Students who submit financial aid documents during peak months (June, July, and August) should allow additional processing time of at least one month to receive an award notification. An award notification is mailed to each student’s permanent address. The student must indicate acceptance or rejection for student and parent loans. Award decisions can be performed on MyEOL (Banner SSB). Students are expected to MyEOL (Banner SSB) for award changes including reductions and cancellations. It is the student’s responsibility to stay informed of the university’s SAP standards and to monitor their progress. For SAP purposes, student’s academic records are reviewed by the Scholarships and Student Aid Office each academic year at the end of the spring semester. Students who are not meeting one or more of the Satisfactory Academic Progress Standards are not eligible for financial aid for the next academic year. Eligibility may be regained by resolving all deficiencies (except the Maximum Length of Study). Federal regulations require the university to establish Standards of Satisfactory Academic Progress, involving both qualitative (cumulative grade point average) and quantitative (hours earned compared to hours attempted), and a maximum length of study. This requirement applies to all applicants for any federal assistance, including Federal Pell Grants, Federal Supplemental Educational Opportunity Grants (FSEOG), Federal Work-Study, Federal Perkins Loan, the William D. Ford Direct Loan Program, which includes the Federal Stafford and Unsubsidized Stafford Loans for students, and Federal PLUS Loans for parents of undergraduate students. The same standards may apply to all assistance from the State of North Carolina and all other aid that is determined by the Scholarships and Student Aid Office. To be eligible for financial aid at NCCU, whether or not aid was received in the past, students must be in compliance with all three of the following areas: cumulative GPA, hours earned, and maximum length of study. Students must maintain the minimum cumulative grade point average indicated for satisfactory progress toward graduation requirements. These standards are consistent with academic standards required for graduation. In order to receive federal financial aid or other need-based aid, a student’s cumulative grade point average (GPA) must be at least 2.0 or greater. We recommend that undergraduate students attempt to earn at least 32 hours per academic year in order to graduate in four years for programs that require 124 credit hours. Note: To remain eligible for financial aid, undergraduate students must earn 67% of total attempted hours for all previous periods of enrollment. Full-time enrollment: 12 or more course credit hours. Half-time enrollment: 6 course credit hours. To earn hours at NCCU, one must receive a grade of A, B, C, or D (including “+” or “-“). All other grades, including F, I, W, WC, WF, AU, NU or NP, do not earn hours. Classes from which a student withdraws after the drop/add period count as attempted but not earned hours. Therefore, withdrawing from classes after the drop/add period will negatively affect students’ ability to satisfy the hours earned standard. Audited courses count as attempted but not earned hours. Therefore, auditing classes will negatively affect students’ ability to satisfy the hours earned standard. When a student repeats a course, the total attempted hours will increase with each repeat, but the student may only earn hours for a successfully completed course once. Therefore, repeating courses may negatively affect students’ ability to satisfy the hours earned standard. Accepted transfer credit will count as both attempted and earned hours. To remain eligible for financial aid, undergraduate students must complete their degree requirements within 150 percent of the published length of their academic program. At NCCU, this means that students in programs requiring 124 hours for graduation will be eligible for financial aid during the first 180 attempted hours as an undergraduate. All attempted hours are counted, including accepted transfer hours, whether or not financial aid was received, or the course work was successfully completed. No financial aid will be disbursed for the student during subsequent semesters unless the student has an approved Satisfactory Academic Progress (SAP) appeal and Financial Aid Progression Plan on file. Students pursuing a double major or a second degree are eligible to receive financial aid until their cumulative registered credits equal 150% of the required number of credits for their dual or second program. At the end of every spring semester, a year-end review is completed, and students who are out of compliance with one or more of the satisfactory academic progress standards become ineligible for further financial aid until all deficiencies are remedied. The Scholarships and Student Aid Office sends written notification of ineligibility to students to their NCCU email address. Satisfactory Academic Progress and eligibility for financial aid are determined each academic year after the spring semester grades are available. After the annual review a student will be assigned a SAP status. Please see definition of statuses below. Students who are not meeting the standards are ineligible for financial assistance for the next enrollment period. To regain eligibility for financial aid, a student may file a SAP appeal form. Approvals are granted for one semester at a time. All Financial Aid Progression Plans will be reviewed at the end of each semester. To remain eligible for financial aid, students must successfully complete their Financial Aid Progression Plan. Students who have filed an appeal and progression plan, the appeal was reviewed an denied. The student then requested a second review. Upon second review, the appeal is now approved. Students who fail to successfully complete their Financial Aid Progression Plan become ineligible to receive financial aid for the next semester. In order to possibly receive financial aid for the next semester, ineligible students may file a new SAP appeal form with the Scholarships and Student Aid Office. Students who are not meeting the academic standards as well as the financial aid standards are ineligible for financial assistance for the next enrollment period. Students who submitted a SAP appeal and progression plan and after review by the committee, the appeal is denied. In order to regain possible financial aid eligibility, the student must demonstrate successful academic progression. Satisfactory Academic Progress for Summer School will be based on the student’s eligibility as after Spring grades are reviewed. If you are deemed ineligible after the Spring semester, you will not qualify for financial aid for the upcoming Summer or any future terms until you are meeting the satisfactory academic progress policy. Federal regulations allow for certain cases in which the school may waive the standards. Specifically, if a student’s failure to be in compliance with one or more areas of satisfactory academic progress is due to events beyond the student’s control, such as a student’s extended illness, serious illness or death in the immediate family, or other significant trauma, and if such mitigating circumstances can be appropriately documented for the specific term(s) in which the deficiency occurred, the student may appeal to the Scholarship and Student Aid Office. Eligibility may be regained by appeal. Contact the Office of Scholarship and Student Aid Office to obtain a Satisfactory Academic Appeal form or visit our website at www.nccu.edu/SSA. Federal and state funds will no longer cover courses repeated more than two times with a grade of D or greater. New regulations for Federal and State student aid programs specify that previously passed courses repeated more than once can no longer be counted in the enrollment status for determining a student’s federal and state aid eligibility. For example, a student enrolls in CHEM 1212 (a 3 hour course) for the first time and receives a “D” grade. He repeats this course and it is eligible to be counted in his enrollment for federal financial aid purposes since it is his first repeat of the previously passed course. He receives a “C” in the course. The student then decides to enroll in this course a third time. Based on the new regulation, the course cannot be included in his total hours of enrollment for federal financial aid purposes; so, if his total enrollment for the semester is 12 hours, only 9 hours can be counted in determining federal aid eligibility. Maximum time frame for the Subsidized Stafford Loan Program is 150% of the program or 6 years. Grade period eliminated for loans disbursed on or after July 1, 2012 and before July 1, 2014. Pell Grant maximum time frame has been reduced to 6 years or 12 semesters.